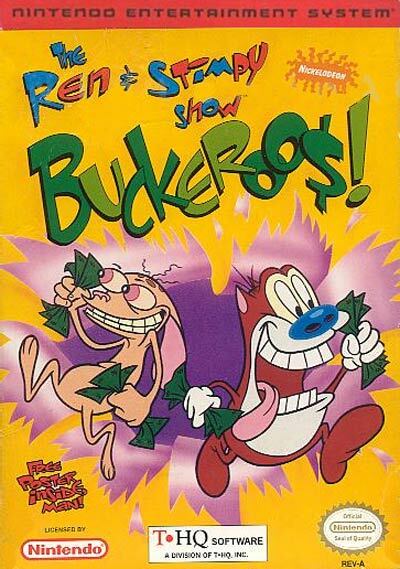 Ren & Stimpy are up to their old tricks again in THE REN & STIMPY SHOW: Buckeroo$! This time, Stimpy has invented a machine that pays you to play videogames called the Gametron 5000 Moneymaker! There are three games in the Gametron. "Robin Hoek of Logwood Forest" has you rob from the rich, give to the poor, and rescue Maid Moron. "Out West" is where Three-Fingered Hoek and his sidekick Stimpy the Kid go on a journey to steal a horse and "Space Madness" has you trying to save Commander Hoek (who has come down with Space Madness) and his ship from crashing into the Earth.